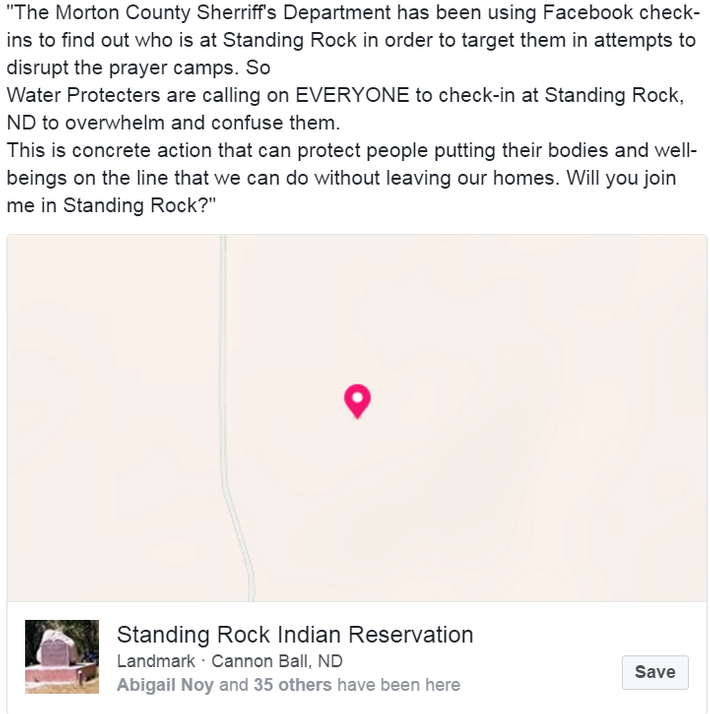 If you’ve been on Facebook today, you might have noticed a large number of your friends have seemingly decided to travel to North Dakota on this fine Halloween day, checking in at the Standing Rock Indian Reservation, where protesters are currently resisting the construction of the Dakota Access Pipeline on sacred Sioux land. Except, chances are good most of your friends aren’t where their Facebook would lead you to believe. Instead, checking in at Standing Rock seems to be the latest viral copy-and-paste Facebook status to take over the World Wide Web. But as with so much social-media activism, there’s very little evidence that checking in to Standing Rock on Facebook makes much of a difference. Even if you don’t believe the sheriff, it’s worth considering exactly what the Facebook status is claiming. What would be the point of the cops monitoring Facebook to see voluntary check-ins? Anyone who wants to avoid the sheriff simply wouldn’t check in on Facebook. Plus: The Sheriff’s Department already knows exactly where the protesters are located. Now, obviously, law enforcement has a history of using social media to monitor and gather intel on activists, and all protestors should just assume their tweets, posts, and photos are being watched. But there’s very little that an extra few thousand check-ins on Facebook can do to prevent that from happening. There is no doubt that law enforcement comb social media for incriminating material and monitor communications. There is no solid line between “organizers” and “others”- this is a movement, not an organization. There are many camps and points of contact, we can only verify that it did not originate from the Sacred Stone Camp FB page. We support the tactic, and think it is a great way to express solidarity. Checking in via Facebook is a nice show of solidarity, but not much else. Want to help the Standing Rock protestors? 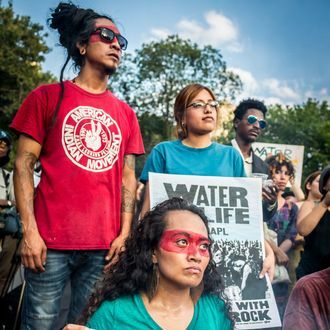 You can make a donation to the Sacred Stone Legal Defense Fund via Fundrazr. (If you really want to help, give directly to their PayPal via email and the organization won’t have to pay any fees to the crowd-raising platform.) You can sign the pledge to resist the DAP. Purchase something to donate off the Sacred Stone needs list or call up North Dakota governor Jack Dalrymple at 701-328-2200 and give him a piece of your mind. Alternatively, you could also go to North Dakota and do work on the ground. Make sure to check in on Facebook when you arrive.